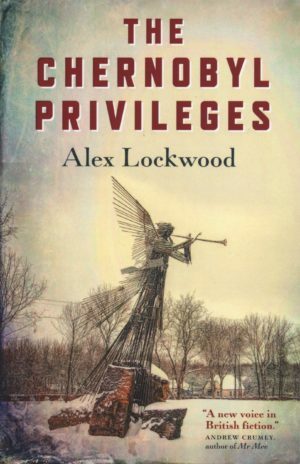 The Chernobyl Privileges by Alex Lockwood. Roundfire Books. 2019. It’s not unusual for me to read nonfiction books written by acquaintances, colleagues, and even friends who are authors writing about animal advocacy, animal rights, and animal studies. Often but not always their work is something I admire and use myself in my role as an author and independent scholar and consultant in animal rights. It’s an entirely different question, however, when it’s a fellow traveller in the animal rights movement who writes fiction, and the book isn’t directly related to the question of our confused and contradictory relationship with animals. Further, I’m someone who holds strong opinions about fiction and not afraid to share them. I know a good novel when I read one and have my beloved authors who I often turn to regardless of what anyone else may say. So, what if I didn’t like The Chernobyl Privileges? What would I say? How would I navigate a delicate intersection of personalities, friendships, and interests? Fortunately, these are worries that I don’t have as I greatly enjoyed reading The Chernobyl Privileges. This is a political thriller that’s a satisfying read exploring key issues about how we live and the world we live in. One of the main characters is the disaster at the Chernobyl nuclear power plant in the former Soviet Union in 1986 when a reactor exploded thereby spreading radioactive material over western USSR and Europe. To speak of a nuclear power plant as a character in a novel may feel wrong but Chernobyl is ever-present here even when the storyline jumps from the time of the disaster to the present where it’s predominantly set. Now, I don’t want to give anything away that would spoil or scare any future reader from the novel but suffice it to say that the main human character, Anthony, has an intriguing link between the Chernobyl disaster of the past with the present accident at the nuclear submarine naval base in Scotland where he works as a civilian employee. The plot device to bridge the two disasters is clever and intriguing but at times it felt stretched. This isn’t a major flaw, however. The novel reads with a great deal of credibility not only in the technical details (never boring or overwhelming) but also in the human drama. It’s clear that a great deal of research and thought went into conceiving and writing this book. It fully held my attention once I reached a third of the way in and it made me want to read it quickly to find out what happens. So, it turns out my nervousness was ill founded. The Chernobyl Privileges is an accomplished first novel with a compelling human drama set against a major contemporary issue.